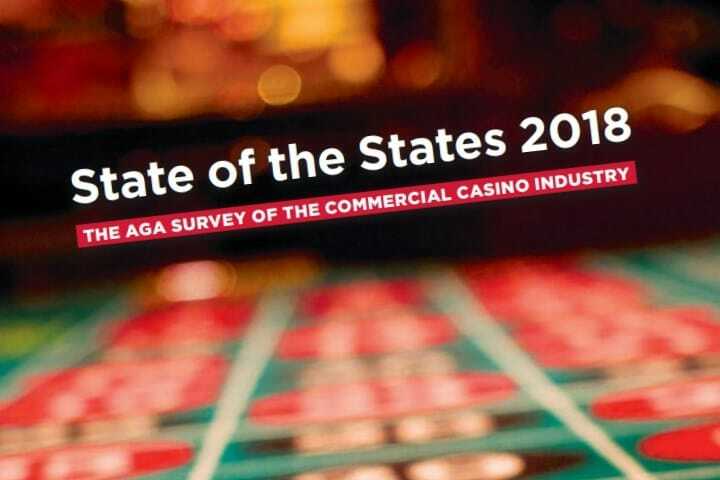 The annual “State of the States” report from the American Gaming Association is out today, and once again it provides a fountain of U.S. gambling information and context. Biggest gainer? Maryland, with a new casino outside of Washington, D.C., rising from $1.2B to $1.6B, or 34.2%. Other double-digit gainers were New York (16.4% to $2.3B) and Oklahoma (10.2% to a mere $124M after going to 24-hour openings). The Biggest Loser was West Virginia, down 4.6 % to $625M (blame that new MD casino). It’s noted that the National Indian Gaming Commission pegs tribal gaming revenues not far behind their commercial brethren, at $32.4 billion. Hawaii and Utah remain the only states not to offer any form of gambling. The only change was NYC dropping a spot. Note that AC/NYC/Philly/Poconos accounts for $6.22B – nearly matching the Las Vegas Strip. In the 15 states that separate the two streams, table game revenue grew 5.8% while gaming machines were up just 1.8%. Illinois commercial casino gaming revenue was down slightly to $1.41B – the fifth straight year of declining revenue, the report notes, since video gaming terminals were legalized at bars and taverns. Gaming machine revenue at those riverboat casinos was $1.1B, eclipsed for the first time by the video gaming terminals at $1.3B. If Chicago ever gets to have VGTs, the casinos would likely be further impacted – something for all states to think about. Fascinating tidbit about how former U.S. Senator Dennis DeConcini of Arizona, the author of PASPA – the Professional and Amateur Sports Protection Act of 1992 that was the center of the New Jersey sports betting saga for seven years – did so in part because of concerns that organized crime might infiltrate gaming operations or impoverished Native American reservations in his state. But the report said that DeConcini says he no longer has any such concerns. Nevada sports betting climbed 13.5% in 2017 to $249M, though that figure was just 7.3% more than what had been the record high in 2015. Three racinos in New York State – including Vernon Downs, which is operated by Meadowlands Racetrack owner Jeff Gural – experienced double-digit revenue losses as new casinos opened in their regions. At this point, almost anywhere a new casino opens in the U.S., some other gambling locale pays the price. The gaming machine revenue at Yonkers Raceway, Aqueduct, and a new slots parlor on Long Island accounted for two-thirds of the state’s gaming machine revenues. The Resorts World at Aqueduct revenue of $848M was No. 1 for commercial casinos outside of Nevada, while Empire City at Yonkers was 4th at $601M. South Dakota has 26 commercial casino locations – all in the city of Deadwood, near the Wyoming and Montana borders and within Black Hills National Forest. Oh, and the maximum bet is…100 bucks. Six states offer greyhound racing: Alabama, Arkansas, Florida, Iowa, Texas, and West Virginia.